Microsoft's new tablet computer was announced with a bit of fanfare -- and curiously, a stylus. When Apple introduced its touchscreens (not counting the Newton), Steve Jobs dismissively tossed away the idea of using a stylus and said the finger is the best pointing device around. Well, stylus technology is getting better all the time, and here are just a few examples of some styluses/styli that might beat the finger. We already covered the interesting "pay what you want" experiment done by the two guys who developed a nicer stylus for the iPad. 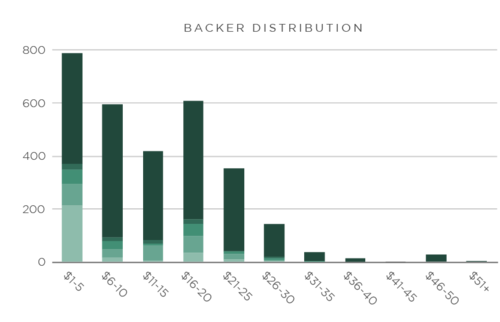 As we noted at the time, "pay what you want" seems like a risky way to do tangible goods offerings, but with the Kickstarter model, it was possible to set it up with a threshold that had to be met to make the experiment work. That resulted in what appeared to have been a mix of motivations in the prices that people chose, with some trying to come in just a bit under the average needed to get the deal. And, of course, some came in at the cheapest possible. In the end the pricing came close, but didn't quite hit the threshold, so the guys added a flat-rate $25 option (what they planned to charge when the product came on the market) and they got plenty of buyers at that price, allowing them to go way past the amount they needed. 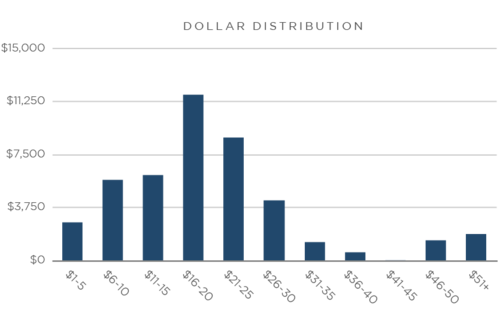 As you can see, there was a more or less standard distribution in terms of actual dollars raised, but that meant there were lots of people down at the cheap end of the scale. In this case, it looks like a bit over 200 out of the 3,000 buyers put in the minimum $1 rate. Also quite interesting is how many people did increments of $5. In case it's not clear, that second graph shows the exact dollar amounts, with the light green being the lowest amount in that range, and the dark green being the highest amount. So, you can see a little over 200 people paid $1, and what appears to be a little over 400 paid $5. As you look down the chart, it looks like most people hit those $5 increments: $5, $10, $15, $20, $25 and $30. In fact, it looks like the mode would be $10. I think the two comments above are both really important. There are all sorts of reasons why people might pay less than the "average" amount needed that have nothing to do with "freeloading." The experiment clearly stated that it was "pay what you want," and I don't see how you can fault anyone for paying what they honestly felt it was worth. Also, there's the point of letting others know about it as well, which shouldn't be underestimated. As I've said time and time again, I'm not always a big fan of "pay what you want," but I can see applications for it. There is definitely an added advantage describe here, in that it offers "early adopters" a chance to get in at a lower price point. In some ways, that's a bit like what the music service Aimee Street tried to do for a while (until it was swallowed up and killed off by Amazon.com). Again, I see some promotional benefit here, but I'm not sure it really makes sense long term. A lot of the commenters talked up how there was a freerider problem here, but again, I don't see it that way. While I'm sure some people just bought it because they thought they could get a "deal," I'm sure many paid what they really felt it was worth. The fact that there were only about 200 $1 bids seems to support that. If there were really so many freeriders, I imagine there would have been a lot more $1 bids. That said, I'm curious how the experiment would have gone if the makers of the stylus hadn't shared the two key pieces of information: (1) that they needed $50,000 out of 3,000, thus establishing the $16.67 average price needed and (2) that they were going to sell it on the market for $25 once they made them. Without those two bits of info, would the charts above have looked different? It seems likely that they would. I would guess a lot more people would have paid lower amounts, but I don't know that for sure. I'm curious what others think on that subject. We recently wrote about an interesting experiment with a "pay what you want" business model for an iPad stylus. While I tend not to be a fan of "pay what you want" for tangible goods (since there's a significant marginal cost), the two designers behind the device decided to combine it with Kickstarter's "threshold" setup. Basically, they asked people to pay what they wanted for the stylus, but also only left open 3,000 spots, and said they needed $50,000. Well, the 3,000 slots went quickly -- in just about a day. But the funding didn't quite reach the necessary level. Instead, it came out at just around $45,000. While this is just a single data point, it probably isn't that surprising from a psychological standpoint. I would imagine many people went through the thought process of realizing that they could try any price, but if they went too low... it might not get made at all. So, for people who want to be cheap, perhaps the "logical" price point is just a bit below the necessary average, hoping that some others will overpay and subsidize you. And that's what happened. As some in our comments noted, perhaps a much more interesting (and possibly better) model would be if there were a way to take the 3,000 highest bidders. In that scenario, if you bid too low, you wouldn't get the stylus at all... but others who bid slightly more would. I'd be fascinated to see how something like that worked out. Either way, with a few weeks left, and the ability to change bids, many expected that enough people would change their bids to hit the necessary threshold. However, rather than wait for that, the designers just added some new fixed-price tiers, that priced the item at the $25 they plan to officially market it at, and a whole bunch of people have paid up, so the overall project did end up going well past the threshold. Definitely an interesting business model experiment, which, once again, highlights one of the risks with a pure "pay what you want" model especially with tangible goods. It can work, but there are pressures to keep in mind. While we're not huge fans of pure "pay what you want" business models, which often feel more like give it away and pray models rather than complete business model concepts, I do think it can be part of a larger business model when done creatively. Of course, for the most part, I had considered pay what you want not to make much sense outside of the realm of digital goods. While some restaurants have found that it can work to do a pay what you want model, it seems a lot riskier, since the marginal cost is pretty high, and you can easily lose out. That's different in the case of a digital work, where the marginal cost is zero. So, for the most part, I haven't thought too much of doing "pay what you want" for tangible goods. However, perhaps it can work, if it's done in combination with a minimum funding goal, using the Kickstarter type model (where people pledge, but no one has to pay until a certain total is reached). Some designers who wanted to create a better stylus for the iPad are running just such an experiment on Kickstarter. They've designed a prototype and need about $50,000 to manufacture the first batch, but they're setting up a "pay what you want" system... while making it clear that they'll only produce the product if they can make that entire $50,000... and they only have 3,000 slots open. You can pay as little as a dollar, and you'll still get the stylus (which they plan to sell for $25 eventually)... but only if the other 2,999 buyers pony up enough to get them to $50,000. Now, I can already hear the complaints, where some will point out that the "suckers" who "overpay" are subsidizing the "freeloaders" who only pay $1. And, if you're not up on basic economics, perhaps that makes sense. But the fact is that everyone in the group is paying what they feel is appropriate to get this product to market in the first place. That some may end up subsidizing others is really meaningless, if they feel what they're paying is worthwhile. As for the other argument that the freeloaders will take over, and thus the product won't get to market at all... well, that's what we're going to see, which is what makes this an interesting experiment. I think part of the problem is that too many people are concerned about the relative issues, in terms of how much others are paying. But, that's mostly meaningless from an economics standpoint. The real question is what is it worth for you to pay to help get this product to market, and plenty of people are perfectly happy to pay a larger amount, knowing that it (a) helps these developers, (b) will make sure the product exists at all and (c) also gets them one of these styli faster than anyone else. And, to them, that's worth it... even if some others get it cheaper.